MONTICELLO, Minn. – After a rough front nine Sunday, the Gustavus men’s golf team got back on track on the back nine to card a first round total of 304 at the Saint John’s Spring Invitational. The Gusties are seven strokes off the lead, which is held by host Saint John’s at 297. 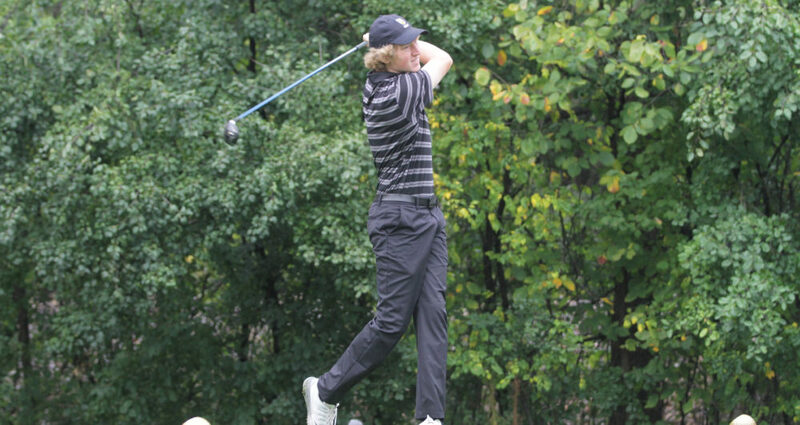 Ben Hauge (So., Ramsey, Minn.) led the Gusties in the first round with a score of 74 and is currently tied for sixth. Chris Captain (Sr., Rochester, Minn.) fired a 76 and is tied for 16th. Both Alec Aunan (Sr., Rock Island, Ill.) and Max Ullan (Fy., Blaine, Minn.) posted scores of 77, and Joe Foley (So., East Gull Lake, Minn.) rounded out the team with a 78. Thomas Carlson (So., Plymouth, Minn.) is competing as an individual and carded a 77 to sit in a tie for 22nd. The second round begins at 10 a.m. tomorrow at Territory Golf Club.